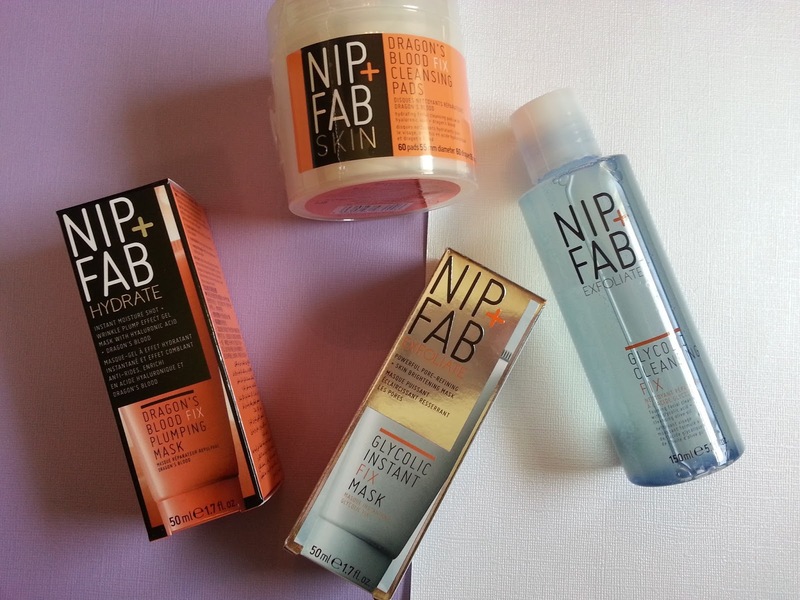 I have never tried Nip + Fab products before, so when I was contacted to give some of the skincare a try, I said yes! I was sent some masks, a toner, and cleansing pads, from the Dragon's Blood line, as well as the Exfoliate line. Refresh and smooth your skin with our gentle Dragon's Blood Fix Cleansing pads. Each of the 60 pads are enriched with salicylic and hyaluronic acids which deeply cleanse your pores and provide long-lasting hydration to help your skin appear plumper. The witch hazel helps reduce the appearance of imperfections, leaving your complexion looking smoother and refreshed. These are just round pads, that are saturated with acids. They work well at exfoliating the skin, without drying it out. My skin instantly felt smooth after using them, and they never made my skin feel dry or irritated. They aren't overly saturated, but they aren't too dry either. They are a good in between, and I like using them on days I'm not using acid serums. This doesn't lather a lot, which is fine by me because those that foam a lot, usually dry my skin out a ton. It smells like grapefruit (which I love!) and it does a great job at making my skin look and feel smooth. It contains glycolic acid, which helps retexture the skin. These masks both have gel like consistency. I've been really enjoying the Dragon's Blood Fix Plumping Mask, because I feel like it is hydrating, and really helps calm my skin. Any time my skin feels dull, or dry, I reach for the Dragon's Blood mask, and it really does plump up the skin, and soothes it as well. 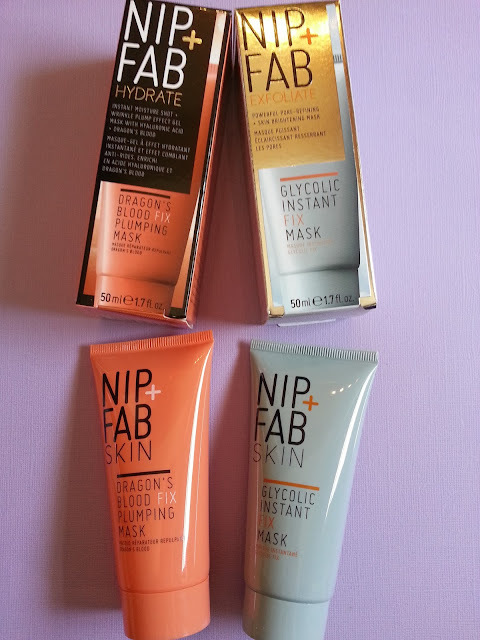 The Glycolic Instant Fix Mask is a little too strong for my skin. It might be because I already use lactic acid every night, and I might have overdone it with this mask. This would be better for someone with acne, and larger pores, without sensitive skin. I would recommend doing a patch test before applying it to your whole face though, just because it's strong! Overall, I really enjoyed these skincare products. 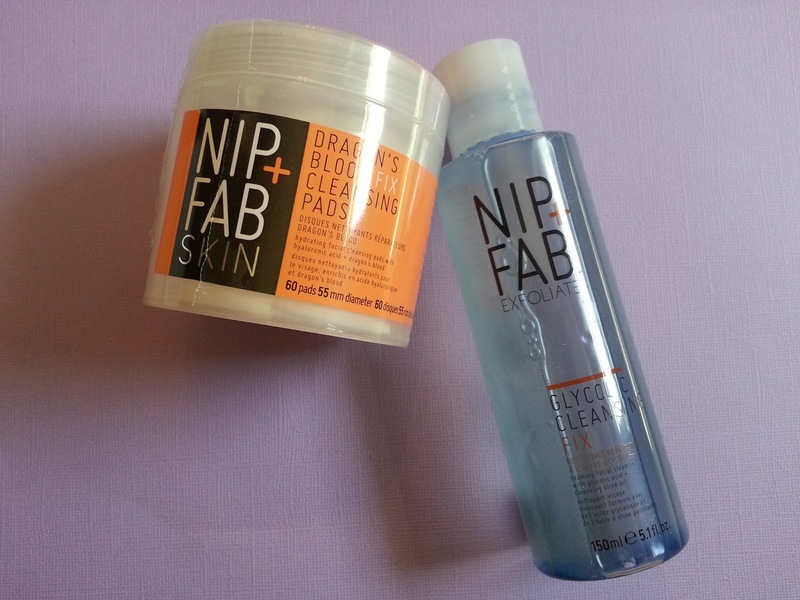 I'm really loving the cleansing pads, and the plumping mask the most. 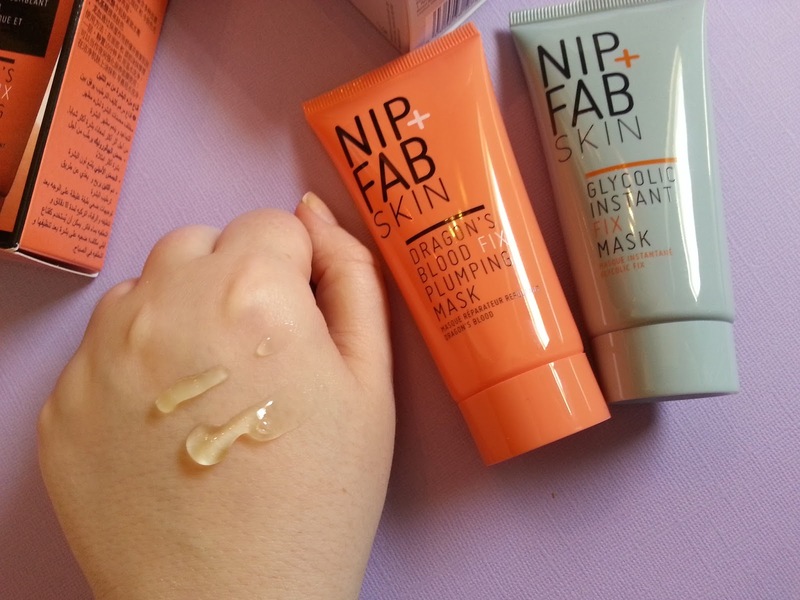 The pads gently exfoliate without irritating my skin, and the plumping mask soothes, hydrates, and plumps the skin. Nip + Fab can be purchased at Shopper's Drug Mart for my Canadian friends!